If you have a legal matter, the attorneys at Hunziker, Jones & Sweeney, P.A. will be happy to discuss your case. We will try to point you in the right direction. Some situations, however, do require either a telephone or in person consultation, for which we charge a nominal fee. If you prefer, we can be reached via email. Just send us a note at info@hjslawoffice.com (or use our contact us form), and we will reply as quickly as possible. You can also reach us by phone at (973) 256-0456. 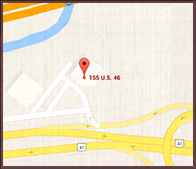 Click here for a map and driving directions to our office in Wayne, New Jersey.